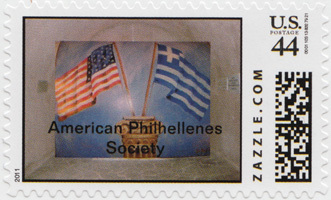 To honor both the United States and Greece for their battles for freedom and to thank the many American Philhellenes and the American Government for their assistance in Greece's battle for freedom during the years 1810 through 1840. George Jarvis, son of the American Ambassador to Denmark, chose to join in the land battles for the freedom of Greece. Dressed in the traditional "foustanella", he learned to speak Greek and after the death of Lord Byron, another Philhellene, Jarvis was charged with delivering Byron's belongings to his family. 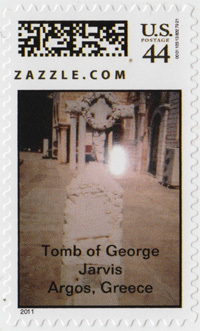 Jarvis was stricken with typhoid and was buried in the forecourt of the church of Agios Ioannis in Nafplion, Greece. 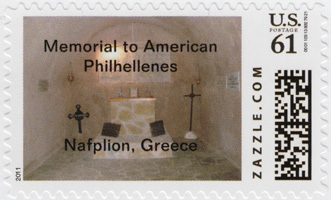 This memorial to the Philhellenes is in the crypt of the Catholic Cathedral in Nafplion Greece. Along with the sculpture depicting a battle between the Greeks and the Ottomans, the crypt also holds the remains of many Philhellenes, including William Washington, a nephew of President George Washington. Washington fought in the battle to break the blockade of the Palamidi, the ancient fort of Nafplion. 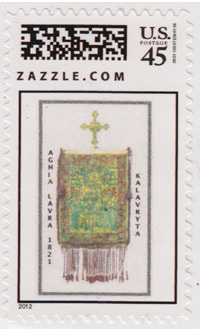 Banner that was raised in Kalavryta to announce the beginning of the Greek Revolution against the Ottoman Empire.